This Student Book and digital bundle covers all core and optional units for the AQA A/AS Level Geography specification for first teaching from 2016. These resources encourage students to develop links between physical and human topics, consolidate knowledge from earlier learning and acquire new geographical skills. The tablet-friendly Cambridge Elevate-enhanced Edition includes rich digital content such as videos that bring learning to life and downloadable content that provide scaffolding and stretch opportunities. This interactive resource also allows student to annotate text and add audio notes, and enables teachers to assess, track and report on students’ progress. 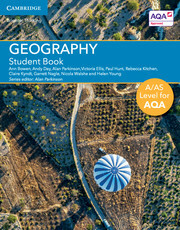 Covers the new AQA A/AS Level Geography specification and assessment objectives, and has been written specifically for the new linear qualification. Includes a range of practice assessment-style questions to support students in developing their exam skills. Provides dedicated support at the appropriate level for fieldwork skills, and for the geographical investigation at A Level. 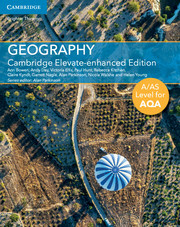 The Cambridge Elevate-enhanced Edition is fully customisable and interactive, allowing students and teachers to annotate text, add audio notes and includes videos to bring learning to life and help students understand key geographical processes and issues. Includes a Student Book and a single user digital licence to the Cambridge Elevate platform, valid for two calendar years.